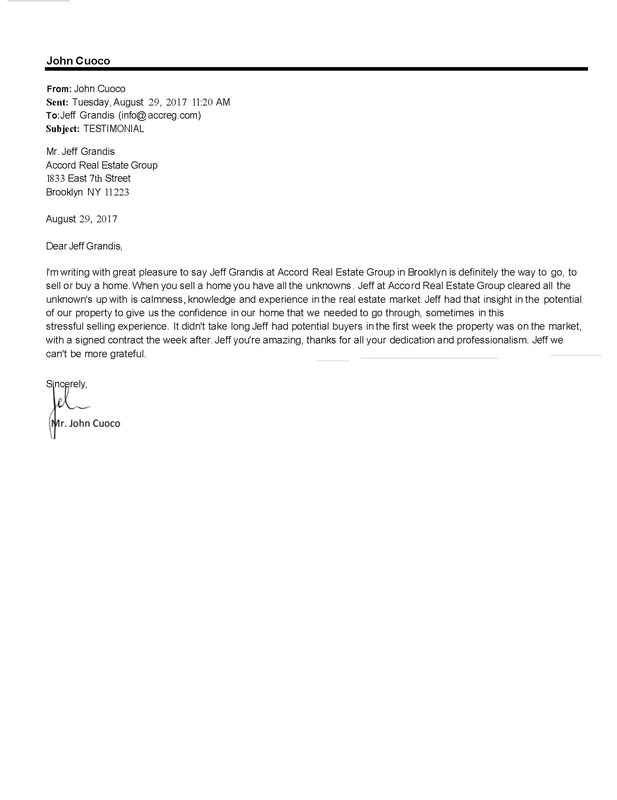 I'm writing with great pleasure to say Jeff Grandis at Accord Real Estate Group in Brooklyn is definitely the way to go,to sell or buy a home. When you sell a home you have all the unknown's . Jeff at Acco rd Real Estate Group cleared all the unknown's up with is calmness, knowledge and experience in the real estate market. Jeff had that insight in the potential of our property to give us the confidence in our home that we needed to go through, sometimes in this stressful selling experience. It didn't take long Jeff had potential buyers in the first week the property was on the market, with a signed contract the week after. Jeff you're amazing, thanks for all your dedication and professionalism. Jeff we can't be more grateful.